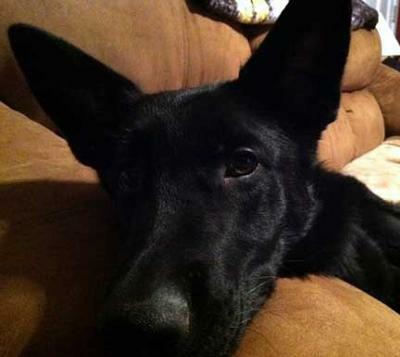 "Duke Siegel" is a year old full bred German Shepherd. Duke is full of energy and rarely will sit still long enough for such a great picture. Duke loves playing outside and chasing tennis balls (his favorite) or soccer balls around the yard. Although he's a dog, at times you would think he was a cat, he likes to sleep above our heads at night and brushes up against us like a cat would. Duke is definitely a lover, and loves to be around people, especially anyone that will play with him whether its tug-o-war (he cheats) or fetch. What a Beautiful Black German Shepherd! He looks healthy and happy. Take care of DUKE and he will take care of you.